However, as any person diagnosed with polyarthralgia would tell you, there is a lot more to it than that! If you or a loved one has been diagnosed with polyarthralgia, or your healthcare team feels your symptoms may indicate polyarthralgia as a possible diagnosis, this article will offer a comprehensive overview to help you navigate the diagnostic and treatment process with more confidence and hope. While the two share certain symptoms, and certainly both can be present at the same time, at their core they are distinguished both by the range of underlying causative factors as well as the core symptoms. With arthritis, both inflammation of the joint and joint pain generally must be present in order to make a firm diagnosis. With arthralgia, pain and stiffness must be present but not inflammation in order to make a firm diagnosis. As well, arthritis is typically caused by past joint injury, obesity or overweight issues that cause undue joint pressure, past issues with gout, psoriasis or infection or age-related bone loss. Arthralgia, on the other hand, can be caused by issues that have nothing to do with joints, bones or arthritis, such as hypothyroidism, tendinitis, strain or overuse joint injuries or even cancer of the bone. 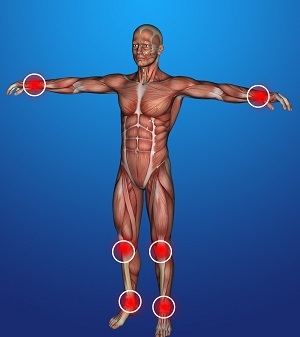 Polyarthralgia, fundamentally, affects several joint areas of the body with pervasive pain or stiffness which some patients liken to the pain caused by fibromyalgia (floating pain without an easy-to-pinpoint source). It is also important to distinguish between polyarthralgia, which is the diagnosis given when five or greater joints are affected, and oligoarticular disease, which is the diagnosis given when four or fewer joints are affected. » Bacterial infections (rheumatic fever, streptococci, staph). » Auto-immune disorders (lupus, tuberculosis). » Rheumatoid arthritis or osteoarthritis. » Insect bites (Lyme disease). » Virus exposure (Epstein-Barr, HIV, hepatitis). » Metabolic disease (gout, Wilson’s disease). » Ankylosing spondylitis (spinal arthritis). » Endocrine disruption (hyper or hypo-thyroidism). There can be additional underlying causes as well, but these represent the major categories of the best-known causes. What Are the Warning Signs & Symptoms? Polyarthralgia can be extremely difficult to detect, especially in the early stages. Because it does share so many symptoms with many other conditions, and is often confused with arthritis, it can take diligent awareness and painstaking recording of symptoms to discern an accurate diagnosis. » Joint pain (ABSENT inflammation). » Redness around joint areas. » Thickening of skin on extremities and nails that doesn’t cause pain. » Lightning or blue tinge at extremities (not always present). » Five or more joint systems are affected. Many patients who have a developing case of polyarthralgia initially suspect they are suffering from arthritis pain. So often a family doctor is the first point of contact for a patient seeking an accurate diagnosis. The family physician will take a full personal and family health history, paying special attention to any family history of rheumatoid arthritis, osteoarthritis, viral or bacterial infection or auto-immune conditions. This will be followed by a physical exam, with special focus placed on the areas where the stiffness, redness and pain is being felt. » CBC (complete blood count) and blood chemistry test. These two basic blood tests look for signs of blood infection, elevated white blood cell count or antibodies indicating an underlying autoimmune issue. » ESR/Sed (erythrocyte sedimentation rate) test. This test looks for markers of inflammation in the body. » C-Reactive protein levels test. This test also looks for markers of inflammation, especially in the heart. » Anti-CCP (anticyclic citrullinated peptide) test. This test looks for the anti-CCP antibody, which indicates rheumatoid arthritis. » RF Latex (rheumatoid factor) test. This test is also used to make a positive diagnosis of rheumatoid arthritis. » Biopsies of joint tissue and fluid. To look for the presence of bacteria, viral or fungal matter and other markers of possible underlying causes. » MRI and/or CT scan tests. These tests can help the doctor look inside the body to get a better sense of what is going on with the affected joint systems. Whether some or all of these tests are ordered will depend on the symptoms list and severity. The goal for the diagnostic phase is to rule out all conditions with similar symptoms presentation and identify both the underlying root cause(s) as well as the presence of polyarthralgia itself. The treatment options for this condition are varied. This is due to the wide range of underlying causes. Typically, the approach to treatment is to first identify the underlying cause(s) and then treat that while also treating the immediate symptoms of polyarthralgia itself. The goal is to resolve or best manage the underlying cause as a pathway to reduction or cessation of symptoms. Depending on the patient’s medical history and other health conditions, a combination approach is often recommended (medication plus therapy plus life skills such as stress reduction for better pain management). 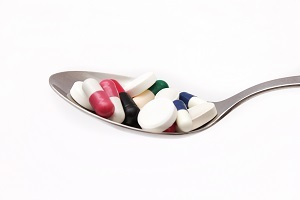 » NSAIDs (non-steroidal anti-inflammatory medications). These can be taken in their prescription or over-the-counter forms. While typically polyarthralgia does not cause visible swelling, it does cause inflammation, which NSAIDs can effectively address. » Physical therapy. Improving range of motion, overall body strength and flexibility are typically key goals for physical therapy treatment. » Joint replacement surgery. In severe cases or as a last resort, joint replacement surgery is sometimes indicated. However, this is typically viewed as an option only when all others have not yielded satisfactory results. » Life skills. It can be debilitating in both body and mind to live with a condition such as polyarthralgia that affects multiple joint systems and has become chronic. For this reason, a part of the treatment phase often includes recommendations for life skills coaching, including stress reduction for pain management using meditation, biofeedback, visualization techniques, massage and other alternative therapies that can provide additional relief. As of now, there is no known method for preventing polyarthralgia. This is due in part to the wide range of causes that can trigger this condition. However, some of these potential causes can be prevented, such as by taking care not to over-use or injure joint systems and to avoid exposure to certain toxins, bacteria, viral or fungal matter. If you have read through the information here and further questions or suspect your symptoms (or those of a loved one) may be a match for polyarthralgia, it is time to take action. » Create a log of symptoms, including frequency, duration and severity (for example, is pain minimal or severe on a range of 1 to 10?). » Reach out to family members to find out if there is any family history of any of the potential underlying causes cited here. » Make an appointment with your family physician and bring the log and information with you to the appointment. » Undergo the physical exam and testing to arrive at an accurate diagnosis. By following these steps, you can progress to treatment where you will be able to find relief from symptoms. Stucco Keratosis – Why it Happens and What To Do About It? Why Do I Have a Callus on My Finger & How to Get Rid of it?